For a long time it’s been too late for a happy ending in Syria. The longer this process continues, the less we can hope for. How do you fight a monster without becoming a monster? How, particularly when the monster’s chief strategy is to make a monster of you? How, when the world’s most powerful storytellers depict you as a monster? How, when monsters hiding behind human facades walk by blindly as you are tortured, raped, humiliated, maimed, murdered? I don’t really know. I’d welcome a reading list, if anyone has one. I know this monster must be fought, even if we become monsters while fighting it. I know we must fight both internally and externally. I know the greater and lesser jihads must be fought simultaneously. At some point, somehow, this stage will be replaced by another. Most probably that stage like this one will be bumbled through blindly. Human beings seldom or never achieve control over their larger social movements. Still, it’s pleasant to imagine that Syrians will be able to defuse the sectarian tensions which have existed at least since ibn Taymiyyeh, which were immeasurably exacerbated by Sykes-Picot and the French occupation’s construction of an ‘army of minorities’, and then set afire by Assad’s gang and its allies. It’s good to hope too that a new constitution will guard against any party, clique or ideological police imposing its straitjacket on the plural people. Beyond religion and politics, environmental factors should also be taken into account. It’s interesting to note that Jared Diamond’s three factors of civilisational collapse (deforestation, soil erosion, water management problems) have been present in Syria since late Ottoman times, and rampant in the last couple of decades. People my age who grew up in Damascus remember that in their childhoods the Ghouta still consisted of orchards and streams, that summer temperatures almost never climbed above the mid to high thirties. You don’t have to be my age to remember the Barada as an actual river, rather than a layer of concrete and a few stinking pools. Wasn’t Damascus the city the Prophet refused to enter, fearing to sin by imagining himself prematurely in paradise? The dicatorship’s corruption (anyone with connections or money could build in the green zone) put paid to that. Stupidly grand development schemes repeated the pattern all over the country (Lake Assad, like Lake Nasser, was an environmental and social disaster – see Omar Amiralay’s film A Flood in Ba‘ath Land – a wonderful exercise in quiet irony). People’s lack of control over the public space meant they were alienated from it, and threw black plastic bags all over it (this explains the discrepancy between people’s spotlessly clean homes and the filth in the streets outside). Over the decade before the revolution erupted, a million climate change refugees, according to the UN, left the desertifying north east for the impoverished outskirts of Dera’a, Homs, Damascus and Aleppo. This, combined with the effects of Bashaar’s crony capitalism, provides the backdrop to the uprising. The revolutions to the west, and the monster’s extreme violence, provided the spark. When the next stage comes, every Syrian city (except two, Tartus and Lattakia – but they may well be burnt in the near future) will have to be rebuilt. Rebuilding them to incorporate gardens for food security is an excellent idea, and surely not so difficult. All it requires is a return to tradition and a rejection of recent perversions. Damascus and Hama already incorporate fields into the inner city. Go back 40 years and the interconnection of agriculture and urbanity was much more evident. 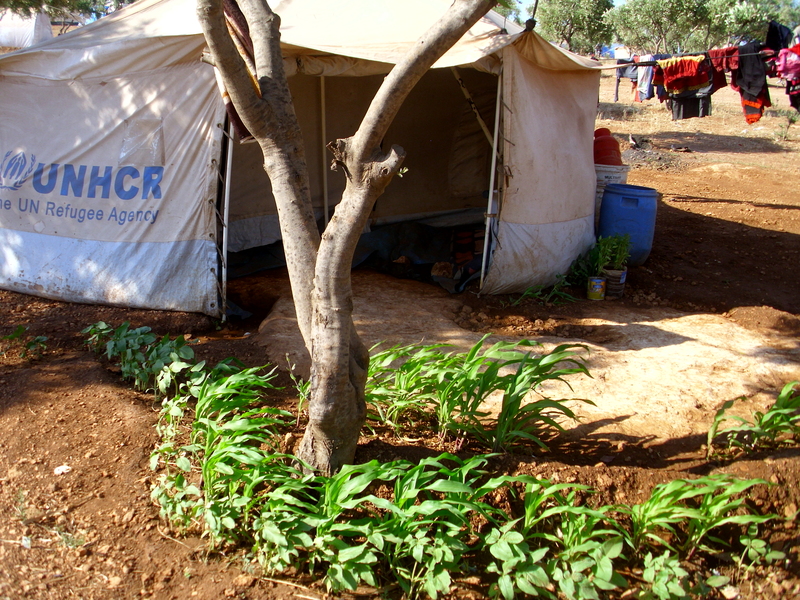 In Atmeh camp I found refugees who’d lost everything growing herbs around their tents. 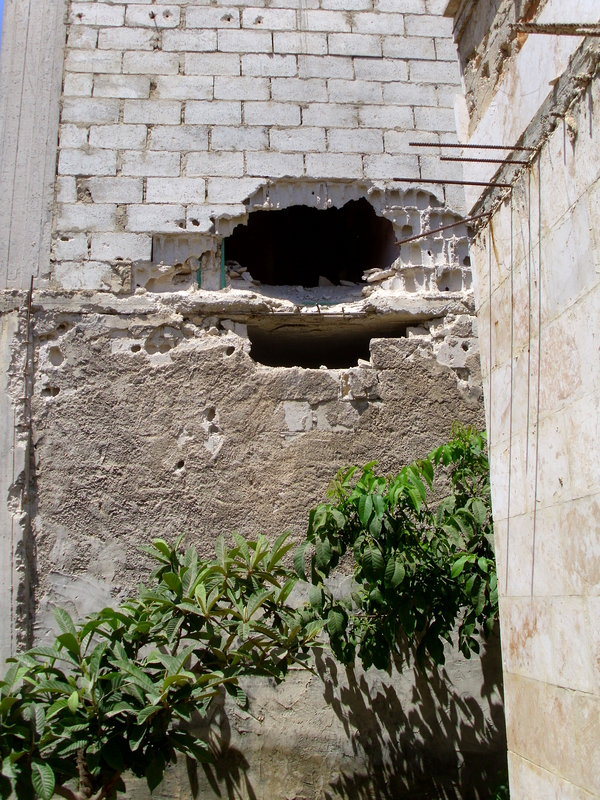 At Hamood’s house in Kafranbul, where I spent a night, a rocket had punctured a wall. Beneath the damage, Hamood pointed to his flourishing radishes. His face lit up in repeatable wonder as he showed me these leaves. Despite the destruction, the people are planting seeds. Here’s Permaculture Arabia’s website. In a region facing an imminent thirst crisis, you’d think there’d be more inerest in this. Whoever inherits Syria (please God, let that be the people themselves) needs to think about this very hard.